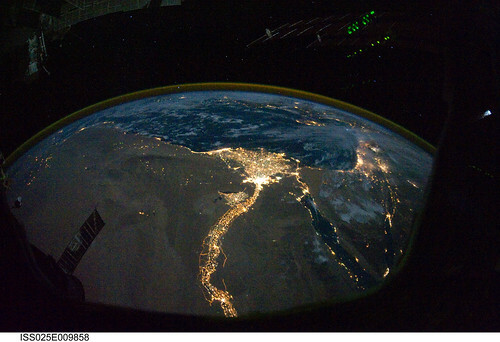 Cairo and Alexandria, Egypt at Night (NASA, International Space Station Science, 10/28/10), originally uploaded by NASA's Marshall Space Flight Center. I tend to avoid reading any news before noon. Why spoil the morning? But then I somehow think it is fine to check Facebook and emails while my coffee brews. Depending on the chatter that too could spoil a morning. The Atlantic article also posts a clip of Foxnews discussing the potential offensive nature of a certain Doritos Ad that has a bit of fun with Communion wafers replaced by Doritos. As I continued to scroll through the Facebook mumbo-jumbo, there was another post by the same friend about a message he had received from Egypt: “From a friend in Egypt-another demonstration of the law of unintended consequences! "Christians and Muslims have been united as never before defending their homes on overnight shifts (due to the lack off police security) this is resulting for many to make friends with neighbors they never knew and there is a real sense of camaraderie which we never had before." What a contrast between the trivial and the extraordinary. In the States, enormous amounts of energy and money is spent over something so benign and unimportant as advertising and perceived offenses of the religious, while neighbors in Egypt with differing religious devotions are losing sleep and safety to watch the other’s homestead. As much as this dichotomy offers up yet another occasion to rant about the decadent shallowness of American television, and to some degree, culture, it is the Egypt story that shines above the dregs. Ever since the Towers fell, Islam has been targeted as an enemy of the States, and many U.S. “Christians” have embraced such rhetoric; as if the Anti-Christ seems to have a face and it looks like Mohammed. All the while, when chaos and “terror” are just down the block, a human face is the only thing Egyptian Christians and Muslims see next door. When I consider the Reality that these Egyptians are fleshing out, I want to be more like them. I would hope in similar circumstances I would be right along side them, creating space for a neighbor to go into his time of prayer with peace of mind, (and not just a piece of my mind). The banter over advertising, which costs $3,000,000 for ½ a minute, is a waste of creative faculties all on its own, a celebrating the mundane and absurd. The news out of Egypt should end the discussion straight out as neighbors discovered that sticks and stones are the things that break bones and homes, not thirty seconds on Sunday. Maybe a little bit of revolution is good for us all once in awhile, after all… even if it is another’s revolution.